It’s beginning to look a lot like Christmas, and that means that it is time for Christmas music. Most people love Christmas music. For many of us, we have heard the same songs over and over for years, and many of those songs, like the ones from Bing Crosby, have been around for generations. Some songs have been redone while others are timeless classics. I’ve never eaten a chestnut that roasted on an open fire, attended a Christmas party hop, or enjoyed a figgy pudding, but that has never stopped me from enjoying those songs. 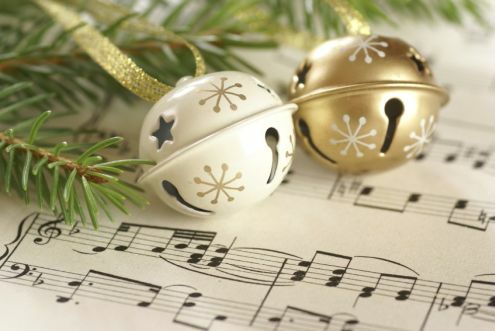 There is something about Christmas music that can put a smile on anyone’s face, even if it only comes from remembering the glories of Christmases long, long ago. As much as I enjoy songs about the most wonderful time of the year, especially during a white Christmas, I still prefer songs about the first noel, the ones that sing about the birth of Christ. I wanted to share some of my favorite lesser known lyrics about the first Christmas and the birth of Jesus. how that in Bethlehem was born the Son of God by name. So bring Him incense, gold, and myrrh, come peasant, king, to own Him. This, this is Christ the King, whom shepherds guard and angels sing. Haste, haste to bring Him laud, the babe, the Son of Mary. Glorious now behold Him arise, King and God and sacrifice. Alleluia! Alleluia, sounds through the earth and skies. Christ, by highest heaven adored, Christ the everlasting Lord. Late in time, behold Him come, offspring of the virgin’s womb. Veiled in flesh the Godhead see, hail the incarnate Deity! Pleased with us in flesh to dwell—Jesus, our Emmanuel. Mary did you know that your baby boy has come to make you new? Mary did you know that your baby boy has walked where angels trod? And when you kissed your little baby you kissed the face of God. Truly He taught us to love one another; His law is love and His gospel is peace. Chains shall He break for the slave is our brother, and in His name all oppression shall cease. Sweet hymns of joy in grateful chorus raise we, let all within us praise His holy name. From depths of hell thy people save, and give them victory o’er the grave. O come let us adore Him, Christ the Lord. I love " little drummer boy"! version by the almost is really great! Amber Lee, I had never heard of them, but I just played that song and it is good. I really like the drums. Many Kings? Its now my favorite. It has an amazing message. I just wished they played it more often. You can look it up on you tube! April, yes, that is a great song. I actually just heard it yesterday. Down Here makes great music. Hey Tommy I just came across your blog and thought I would say hello. ( I actually stumbled across it a while back and then remembered it today so I looked you up.) You may not remember me but I went to ABC with you for a little while until you graduated. Hope you are doing well. Have a good Christmas. I remember you. I tried to find you on facebook, but couldn't. I'm doing great and hope you are. Thanks for stoping by, and have a great Christmas!